Apart from delivering quality, we express our concern towards the quality of life the underprivileged lead. Thus, we have initiated a few practices helping the deprived improve their living. 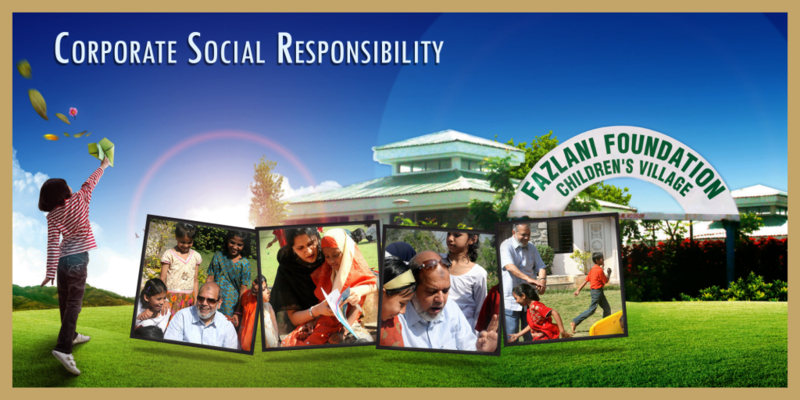 We believe in spreading smiles, thus have established ‘Fazlani Foundation’ comprising ‘Aishabai & Haji Abdil Latif Charitable Trust’ & ‘South Bombay Public Charitable Trust’. We have developed a ‘Children’s Village’ with 4 acres of land and provide medical facilities across 40 villages. We have introduced the Mobile van and Telemedicine facilities at village Takwe, Pune in the campus of Fazlani Foundation Children’s Village. The facility is available to around 40 villages in the nearby areas, thus, fulfilling a large number of medical needs of the underprivileged. The Telemedicine facility provides state-of-the-art diagnostic treatment by health experts connected to Nanavati Hospital Mumbai. These facilities are free, and are a real boon to the deprived population. We also have initiated several- education, sanitation & bore-well facilities in the regions deprived of the respective provisions. We provide basic education to the underprivileged children, unsecured loans to the farmers and initiate several other utilitarian facilities in villages and towns enhancing the livelihood of the needy.